Why is it that tractor-trailers pulling huge loads never slow down regardless of what the road conditions are? Trucks never slow down regardless of the conditions. We just came back from traveling between Ottawa and Montreal. It was a very rainy day with lots of spray and poor visibility. We were passed by several trucks all going over the speed limit without any regard to traffic around them. It is almost as if they are trying to push you out of the way. The spray from their tires can almost blind you in terms of being able to see the road. All of the rest of the traffic was traveling at approximately 90 to 100 kilometers an hour however the tractor-trailers have to go at least 105 110 kilometers per hour. That means they pretty much pass everything in front of them. We saw a couple of cars almost lose it because of the spray from the tractor trailer tires and the slush on the road. These people had to be pretty scared. 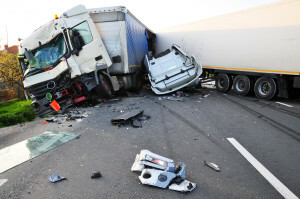 The other thing we notice is that many drivers of trucks as well as cars tend to drive too close to the next person. They have no time at all to react to any kind of situation and break to avoid chain reaction accident. Even if you allow space, adequate space between you and Tthe next car, they will always try to pass you and move in front. We try to drive defensively at all times. Avoid being involved in a chain reaction accident. However on many roads especially in bad conditions no one slows down and is pretty hard to avoid being involved in a chain reaction accident. Better off to stay home and wait for conditions to improve.